MIT’s Technology Review recently published an article on how CardCloud Spells the End of Physical Business Cards. As someone who spends most of their professional life immersed in the online world, I tend to agree that physical business cards are not an ideal tool for information exchange in the physical world. But I have a slightly different idea about why I feel that’s the case. The majority of my interpersonal communications happen online. I work from home, and so do all my fellow employees at ReactionGrid. I’m constantly using tools like Twitter, LinkedIn, email and Skype to touch base with friends and coworkers. I also spend a lot of time in multiuser 3d virtual worlds like Jibe and Opensim, hosting meetings like the Hypergrid Adventurers Club as well as exploring how to use Unity3d to create engaging experiences in Jibe. I even hold weekly office hours in virtual worlds. All of these tools are wonderful. But there’s still something uniquely powerful about meeting someone face-to-face. Technologies can augment interpersonal interactions, but they are no replacement for the high emotional bandwidth experience of sitting down with someone over a cup of coffee. And given the fact that many of us spend most of our time communicating with other people electronically, meeting someone face-to-face can be a very special occasion. But too often, I think we waste this opportunity. We’ve all seen it happen. We get a chance to meet with people in person for a lunch meeting or at a conference. And at some point, someone pulls out their smartphone or tablet and start pecking away. They often start out by saying “I’m taking notes.” But usually they’ll get distracted by email, text messages or Twitter feeds. This often prompts other people to then check their own electronic devices. And pretty soon, you have people sitting around cooling cups of coffee, ignoring each other in the physical world as they immerse themselves in a flurry of electronic communication and information sharing. Which is probably what you should be doing when you are not meeting face-to-face. This also happens all the time. 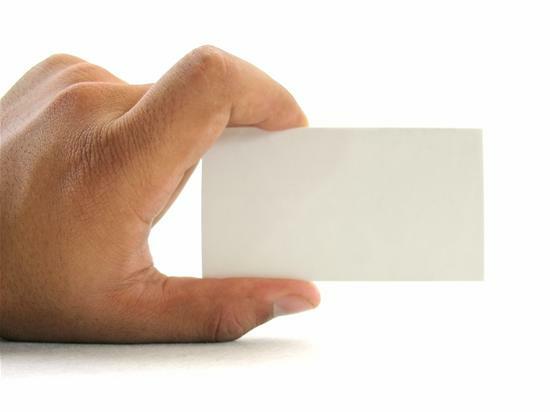 And while physical business cards are a great way to quickly share contact information, they are inherently impersonal because they are one size fits all. 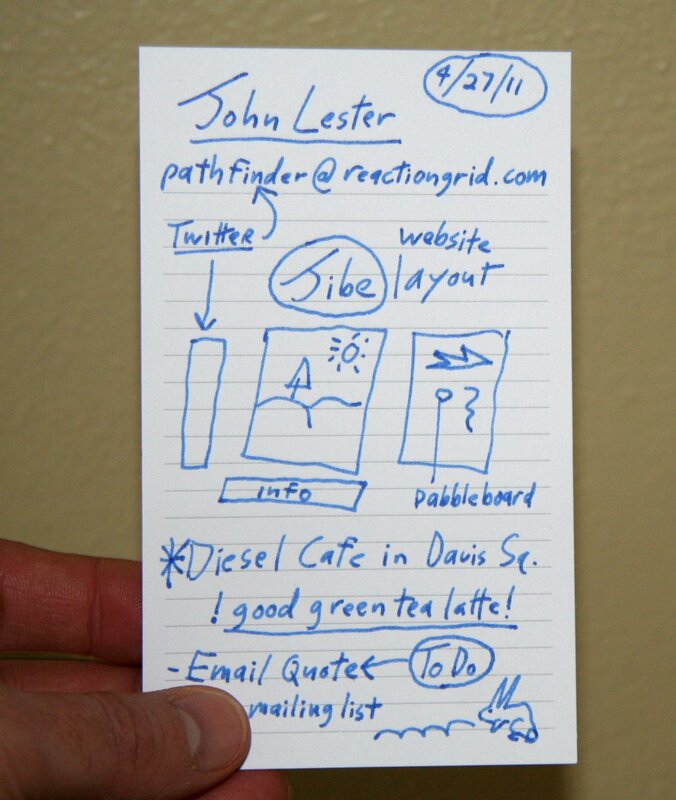 If you’re lucky, a business card has some whitespace where you can jot down some personalized notes with a pen. But you’ve usually got precious little real estate to do that. And forget about drawing a detailed picture. Conventional business cards and electronic devices can be useful tools for sharing information in a physical world meeting. But are they the best tools? Leveraging unique opportunities when they present themselves is a critical strategy for success. And meeting with someone in the physical world is special. So why not make the most of that opportunity? I like pens and paper. Drawing and scribbling helps me think. 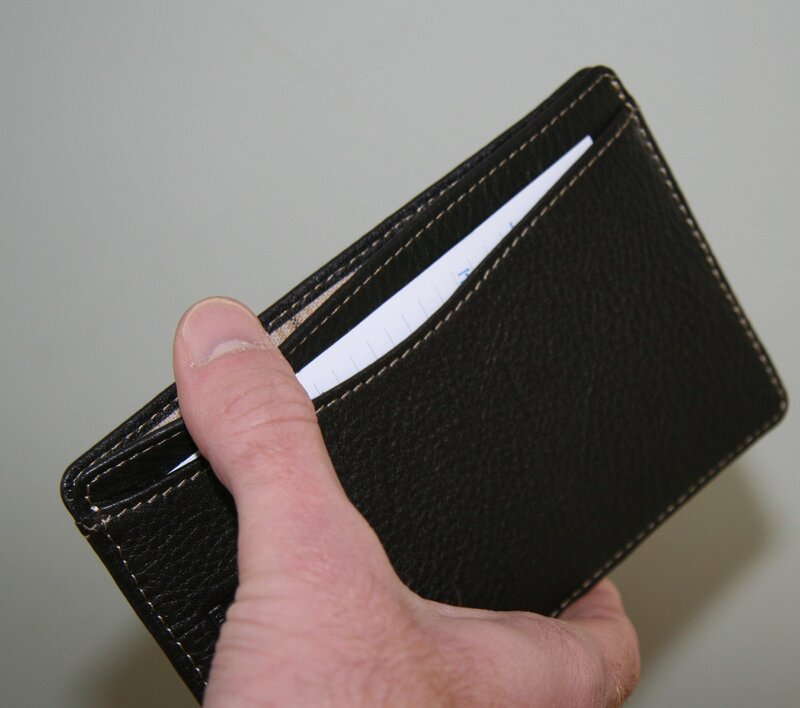 So I carry around a little Shirt Pocket Briefcase full of blank 3 x 5 index cards. Some notes on the history of the adoption of new technologies. As you can see, 1927 was a very interesting year. I use this pad to take notes when I’m reading books or just thinking about something. The pad has a storage area for both completed and blank cards. This system works great for my own personal workflow. But I’ve discovered it works even better when I’m meeting with someone in the physical world. Rather than just handing someone a preprinted business card or pecking something out on my smartphone, I’m getting into the habit of writing out and giving them a custom card. Great meeting with you. Here's my card. Is my handwriting a bit messy and unique? Yes. Is the card full of free-flowing ideas and doodles? Definitely. But that’s what meeting in the physical world is all about. Discovering a tasty new coffee drink together. Laughing while brainstorming. Watching someone scribble a rabbit while talking about animated 3d models in a virtual world. These are the things that happen when you physically meet with someone. Moments of creative collaboration and organic interaction in real-time. And my card above both captures and reflects that moment. So don’t throw away your business cards and electronic devices. Simply try thinking beyond them. Think about creating and handing someone a memorable and unique object that reflects the special occasion of meeting face-to-face. A small handwritten card just might turn into an evocative artifact. And that just might help your big ideas stand out in a world of prefabrication. This entry was posted in Announcements, Augmented Reality, Avatars, Education, Jibe, Pioneer Lessons, Psychology, Unity3D, Virtual Worlds and tagged augmented reality, avatars, business cards, education, index cards, innovation, interpersonal interactions, meetings, online communities, paper, pens, pioneers, psychology, ReactionGrid, strategy, virtual worlds by John "Pathfinder" Lester. Bookmark the permalink. 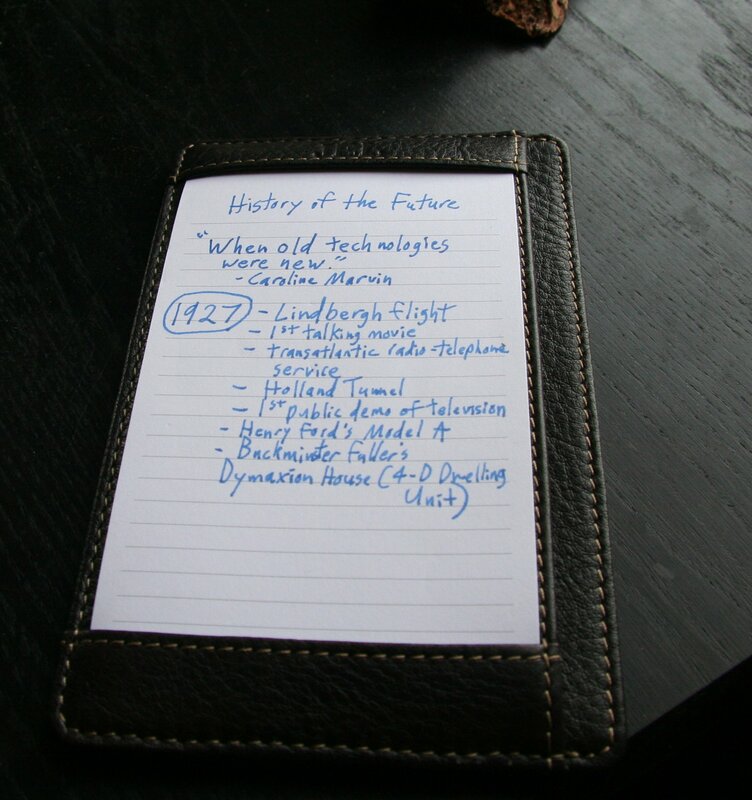 I get much grief when I pull out my 3×5 cards to take notes, while nearby my iPhone sits idle. My son-in-law calls it an “Amish palm-pilot”. Now I have an authoritative blog to counter such grief! TY Pathfinder. Great reminder! I especially like the scribbled reference to the Diesel Cafe, go you! Thanks Mike. I often add things like the “Diesel Cafe” reference because they can serve as memory triggers for physical meetings. Our memories are highly contextual. Reminding someone of the location and good drink they had can help them better recall the entire context of the meeting. And that helps people better remember what was *discussed* at the meeting. Long time ago, I had several sets of cards printed up. One had my “businessy” business info for office-type stuff-fixing computers, making websites; very clean and office-y. Others had various “personal” and artsy layouts- fun code, alternate emails, creative presentations of myself, etc. I always left plenty of space in the design for additions by myself or by the other person, and generally scribbled something on each card I gave out as a reminder to the person of what/when/how we connected for that personal touch. To print a batch of business cards is so inexpensive now that it’s simple to print several different types of cards (even some ‘calling cards’ or meishi. As far as your shirt pocket briefcase… every good tech I know carries something similar. Paper is a proven archival data storage device! 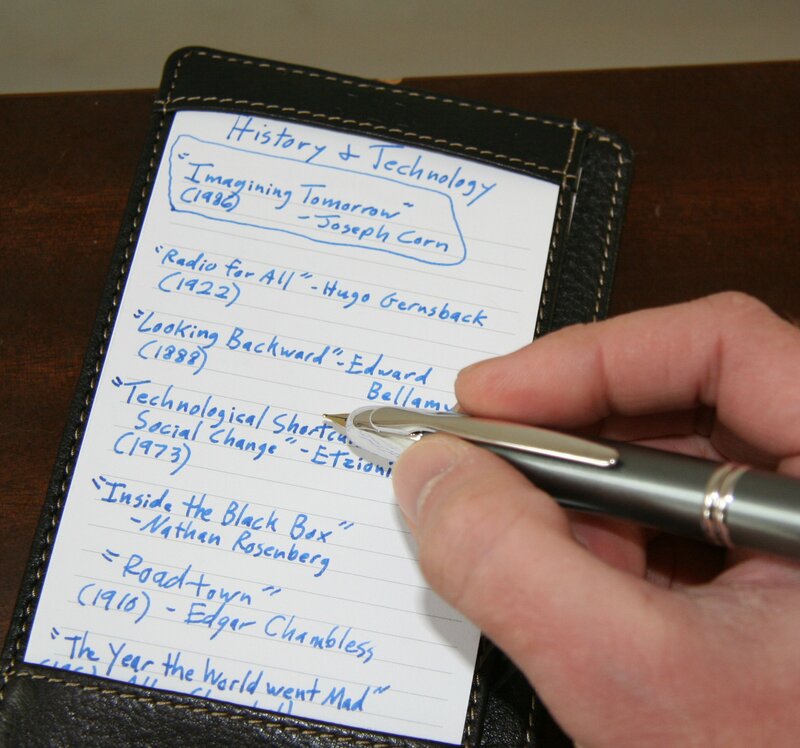 You can drop a paper notebook in water and, if you’re smart and write in pencil, the data will be soggy but readable (unlike those lovely jewel-ink pens that run at the slightest humidity). I can also drop it on cement and I suffer no data loss. Try that with a smartphone! Great strategy! I still like having preprinted business cards. They’re fast and can provide a nice little snapshot of your professional identity. I think the trick (as you explained) is to have different snapshots for different contexts. Thanks for sharing your experience. Maybe have your info printed already – to save time, but leave most of it blank. Like, letterhead? Good idea! I think I can get index cards with information pre-printed on the top. I’m going to look into that.